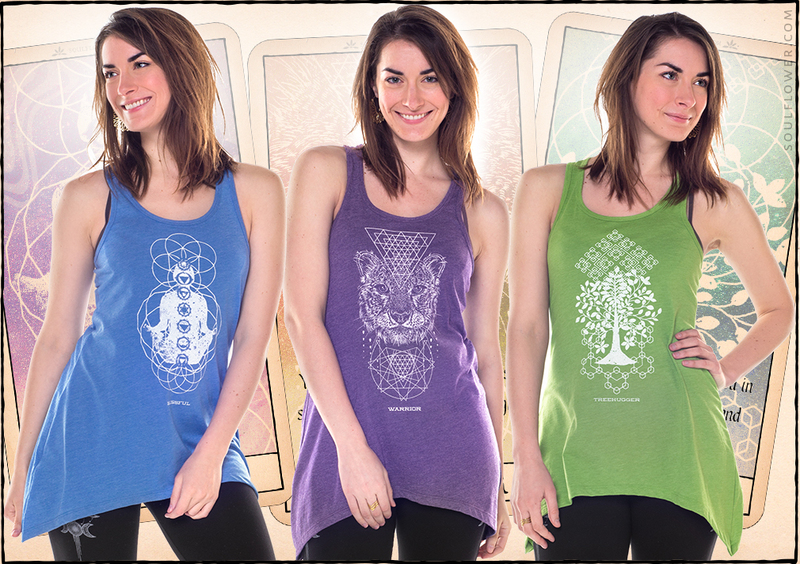 Once upon a time, we made a mini series of tarot-inspired graphics. We shared them on facebook. Ya’ll loved ’em. The graphics on these “tarot cards” were straight-up borrowed from Soul Flower designs. The tree is from a super old-school Soul Flower design, Treehugger, which we created in the early 2000s and still lives on to this day! These cards were inspired by old designs, and they inspired new designs. It’s the circle of life, baby. You value ahimsa, take time for svadhyaya and practice pranayama daily. You find clarity in times of chaos, strength in times of need, and fight for peace always. You feel most at home immersed in nature, breathing in fresh air and basking in the sunshine. 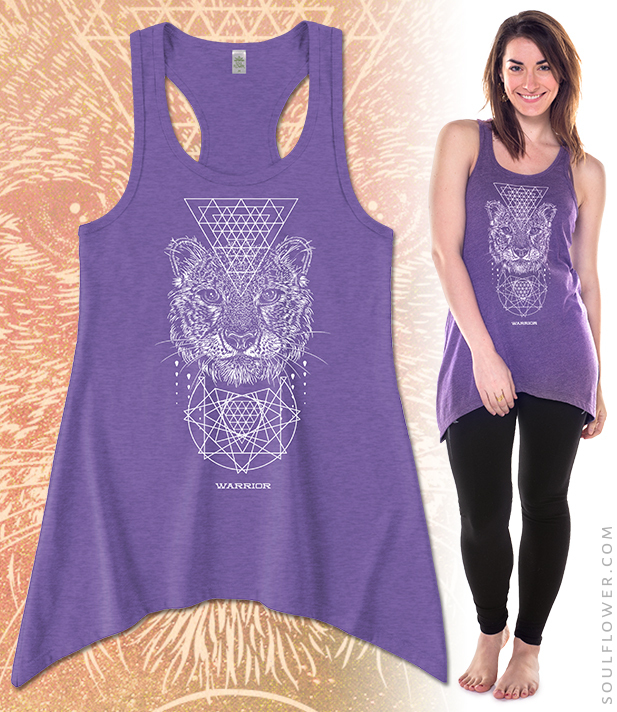 Each tank is 50% organic cotton and 50% recycled polyester (from plastic beverage bottles). They’re made in the USA, dyed with low-impact dyes in 3 custom colors, and screen printed by hand in Minnesota. Eco-fashion at its best! Reading tarot cards is all about being mindful and tapping into your intuition and the wisdom of the universe. We humans like to tell stories, especially through imagery. And that’s what we like to do at Soul Flower with our designs, too. We manufacture our clothing using earth-friendly fibers, and put just as much thought into the graphics and art that goes on them. 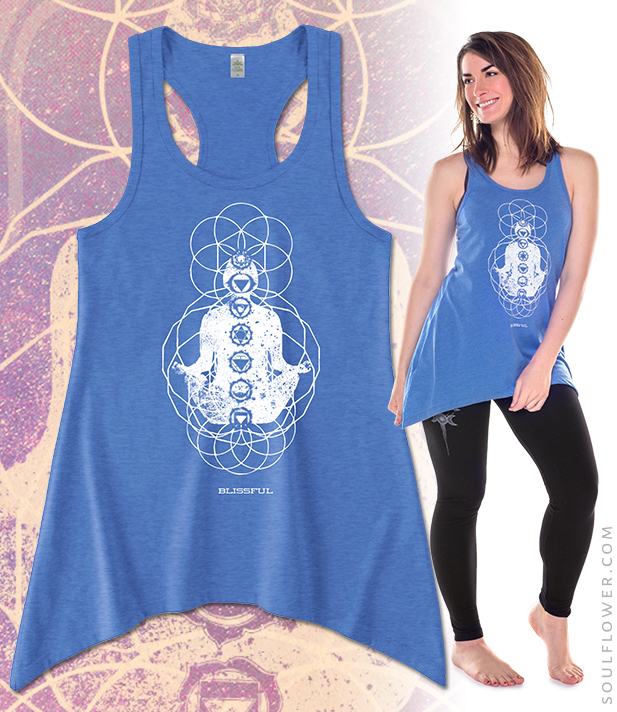 We like our designs to be thoughtful, and to tap into a higher consciousness. What you wear can affect your mood, right? What happens when you put on a top that proudly states WARRIOR? Maybe you walk a little taller, speak your truth a little louder. What happens when your shirt reads BLISSFUL? Maybe you feel your breath deepening and your heart a-fluttering with love for your fellow beings. 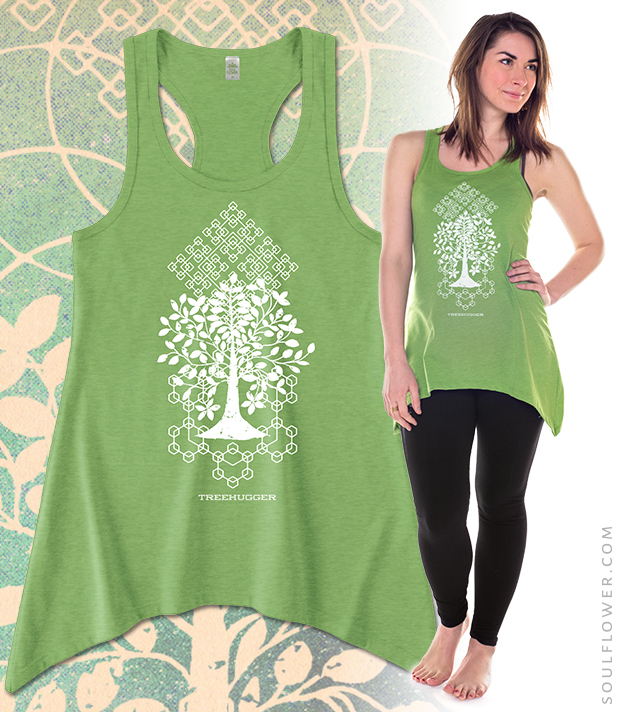 What happens when your clothes announce TREEHUGGER? Maybe you find more moments to zone out in your backyard and make plans for a weekend hike. Whatever you need right now, be mindful and present of the world around you. The universe speaks: sometimes in whispers, in a warm breeze, in the crackling of a campfire, in art. Live your truth. Let your soul flower! « Quiz: What Inspiration Do You Need? I totally missed out on those tarot cards. But I have a kinda cool idea. Why not release them as 11″ X 14″ mini posters? I’m thinking that would be totally awesome!!!!!! !